The silver cord is a well-known symbol in the astral plane, connecting the physical body with the astral body. Many claim to see it when projecting, the cord connected to either the head or the torso. The purpose and shared symbology is a mystery, why have so many people seen this same symbol, and others not seen it at all? Many think the cord exists to show that the projector cannot get lost, and it’s been known to be a fast way back to the body if the projector feels they need an experience to end as quick as possible. There have been written experiences of projectors attempting to sever the silver cord to see what happens, though this may be dangerous as some have suggested that the silver cord breaks upon death. The silver cord, however, is unbreakable, it seems. Robert Bruce, in his book ‘Astral Dynamics’, explores the silver cord further. 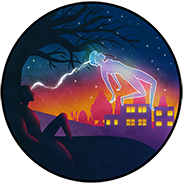 There are indeed a lot of theories about the silver cord; Astral projection is a very subjective experience, so you may or may not see the silver cord.